Polish traditions through the year are full of superstitions, rituals, and holiday celebrations. Some are firmly rooted in the predominant religion of Poland, Roman Catholicism; others stem from pagan rites of the seasons. Learn more about Polish customs and traditions and when Poland's major holidays fall. If you are shopping in the seasonal markets and holiday fairs, you may get caught up in the Polish culture, cuisine, and souvenir shops that maintain a steady stock of folk crafts and handmade art. New Year's Eve in Poland is like New Year's Eve in other parts of Europe. Individuals host parties, attend private events, or head to city squares for fireworks extravaganzas. January 1 is often a day for concerts in auditoriums and carols sung in churches throughout Poland. For example, if you travel to Krakow Poland in January, the Philharmonic performs a year-opening concert. The drowning of Marzanna is a pagan farewell-to-winter tradition that occurs on Death Sunday, before Easter. An effigy of Marzanna, the goddess of the winter seasons, is taken to the riverbank and thrown into the water. Participants watch her "drown." With the passing of Marzanna, the ills of winter are forgotten and spring can return with warm weather and natural bounty. In Poland, Easter traditions are both symbolic and fun. Blessed food, decorated eggs, church services, Easter palms, and seasonal markets help to mark this springtime celebration of faith, joy, treasured customs, food, and family. Juwenalia is Polish for a college student festival that occurs in May or early June before student exams. This event is marked by colorful parades, contests, games, and parties. Juwenalia is an annually anticipated event and started in 15th century Krakow, Poland. Wianki, which means "wreaths" in English, is a pagan festival honoring the midsummer solstice. Wreaths symbolize the cyclical seasons. Krakow's Wianki celebrations are second to none, and they include concerts by big-name performers, fireworks displays, and an annual market. 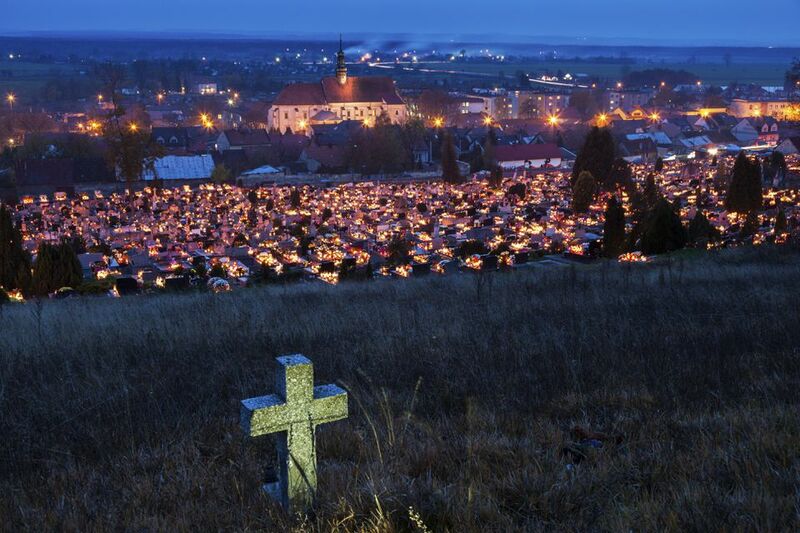 All Saints' Day, November 1, is accompanied by the tradition of decorating cemeteries with thousands of glowing candles. On this night, the worlds of the living and the dead come closer to one another. Poles honor their deceased family and friends with memories, church services, and the flickering candles that brighten graveyards all over Poland. Andrzejki, or St. Andrew's Day, is a traditional holiday that occurs on November 29th. It is an evening of superstition and fortune-telling. On this night, it is said that ​a young woman can predict with whom she will meet and fall in love. Advent helps to prepare Poles for Christmas through fasting, prayer, and church services. During this time, a special mass, called roraty, is held for church-goers. The mass begins just before sunrise in almost complete darkness in the church. The name "roraty" comes from the first words that begin the service, "rorate coeli," which means "heaven, drop dew" in Latin. Mikolaj, the Polish Santa, visits children on December 6, during Advent church services, or on Christmas Eve. He brings children small gifts to reward them for good behavior, but he may also remind them not to be naughty by including a switch with their presents. Christmas is a magical time in Poland during which animals are said to speak and forgiveness is offered to those who have offended. The Christmas Eve feast, known as Wigilia, is shared by family members. The day after Christmas, Poles observe St. Stephan's Day, which extends the Christmas celebrations.